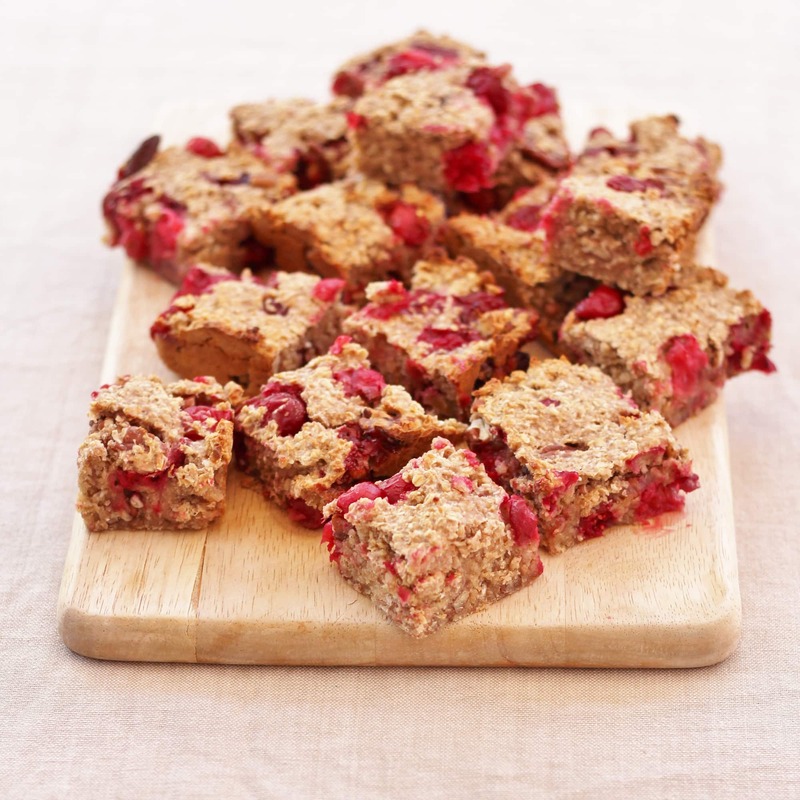 Inspired by a delicious recipe from Livia’s Kitchen, these Cranberry, Cinnamon and Pecan Porridge Squares would make a fab Christmassy breakfast or healthy festive snack. They taste absolutely amazing and take less than 30 minutes to make. Perfect for when life is BUSY!! I don’t know about you, but I am completely and insanely rushed off my feet at the moment. It is partly my fault. I have planned in far too many Christmas ideas for my blog and have consequently been blogging like a lunatic lately!! But also because we are having our bathroom completely redone at the moment (whose bright idea was that, right before Christmas?) and because, well, it’s nearly Christmas and this time of year is always crazy busy, even at the best of times! It’s at busy times like these that I really, really need quick and easy recipes (so it’s a jolly good job I’ve got a whole blog-worth of ‘em!) 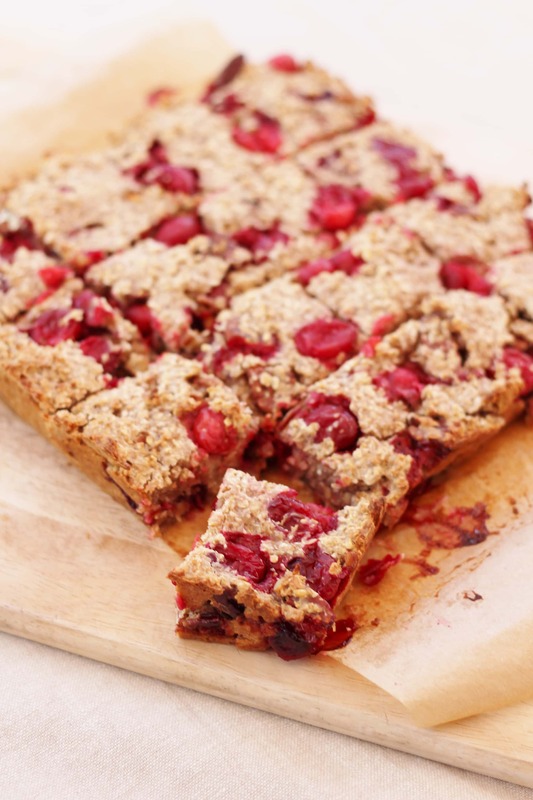 and this gorgeous recipe for Cranberry and Pecan Porridge Squares most definitely falls into that category. They are inspired by a recipe I found in Livia’s Kitchen – a gorgeous book full of drool-worthy AND healthy bakes (yeah, I know! It’s one of my favourite books!!) – for Blueberry Porridge Squares. I adapted the recipe a bit and created my own version back in August, but I really wanted to do a Christmassy version for this time of year. 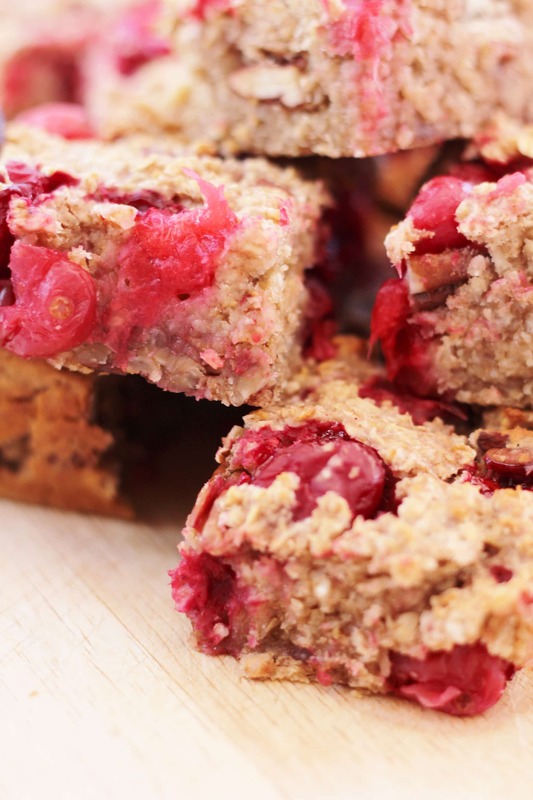 And here they are: Cranberry and Pecan Porridge Squares – stuffed full of cranberries, pecan nuts, maple syrup and cinnamon to make them super Christmassy and just totally delicious too. These look like flapjack, but they are not exactly…they are stuck together with milk rather than a ton of sugar, like flapjacks normally are. This makes them healthier, but no less scrumptious (hooray! 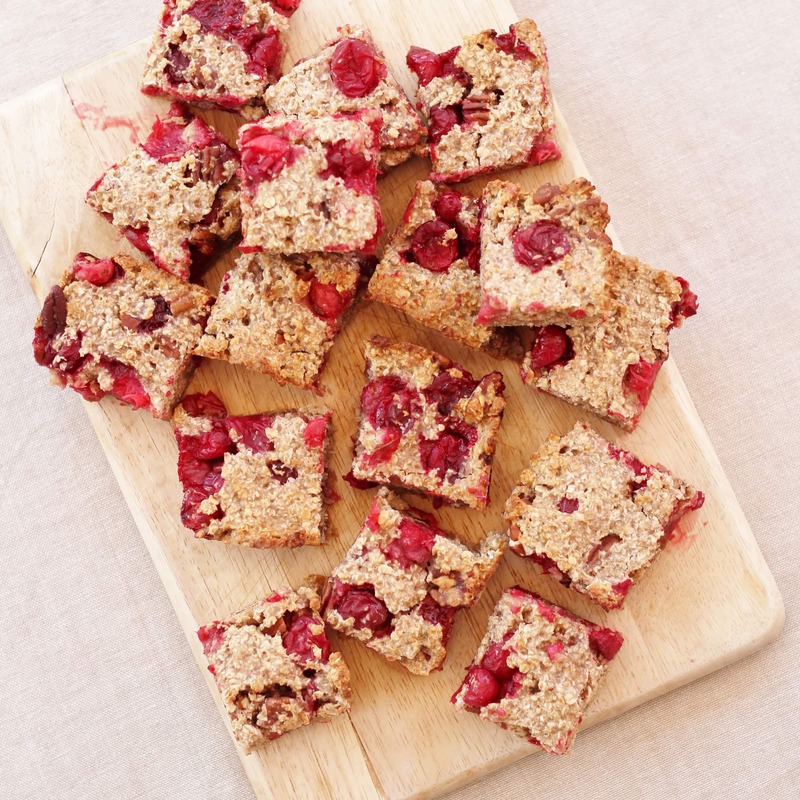 ), it also gives them a gorgeous squidgy texture – which I adore and, as a bonus, means they are less likely to result in dental surgery than normal flapjack!! 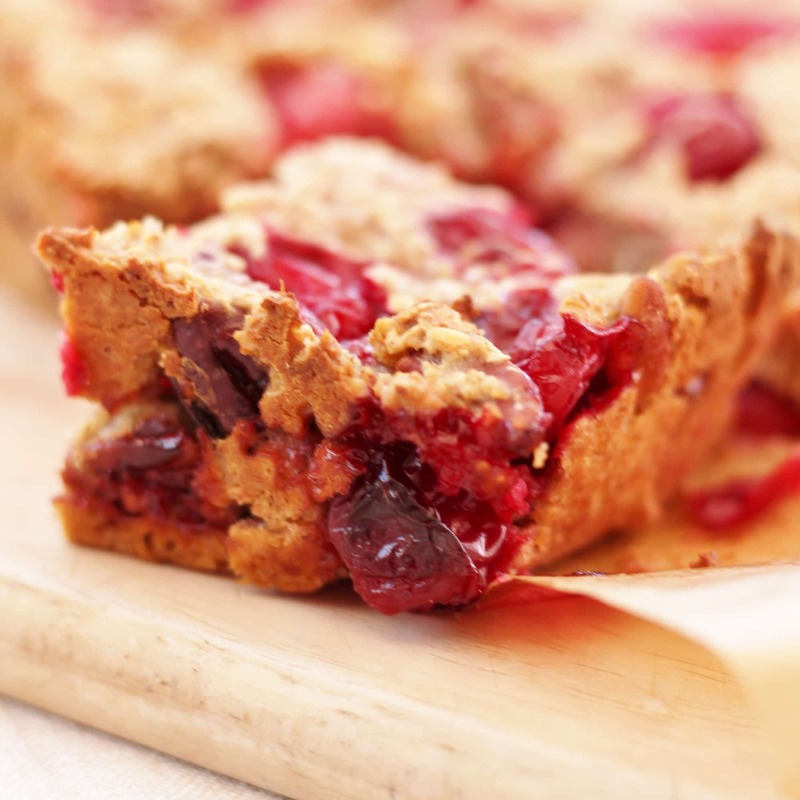 Not only are they delicious and Christmassy and gorgeous, but these Cranberry and Pecan Porridge Squares are also a great free-from option, as they can be made with dairy free milk (I used almond milk, but you could also use oat milk) and gluten free oats (do check the packet, not all oats are gluten free), and they are also vegan friendly, meaning everyone can enjoy these squidgy little beauties. These would be a fab snack over the festive period, great as a healthier alternative to mince pies! They would also make a rather decadent tasting breakfast – and, if you have a batch already made, a rather speedy breakfast too, for when time is tight, or even on Christmas day when you’d rather be opening presents with the family than faffing around in the kitchen. And of course this would be a great bake to do with kids…something totally fun, but quick and easy too. A great way to occupy them over the holidays, especially if you have a whole week off before Christmas, like we do – eek!! Grease your 20cm x 20cm square tin with oil and line with baking paper. Grease the baking paper too. Place the oats and cinnamon in a bowl and mix well. Then add the the milk and mix together until combined . The mixture will be quite stiff as the oats quickly absorb the milk. Add the cranberries, pecans and maple syrup and mix thoroughly – some of the cranberries will get squished, don’t worry, that’s a good thing. 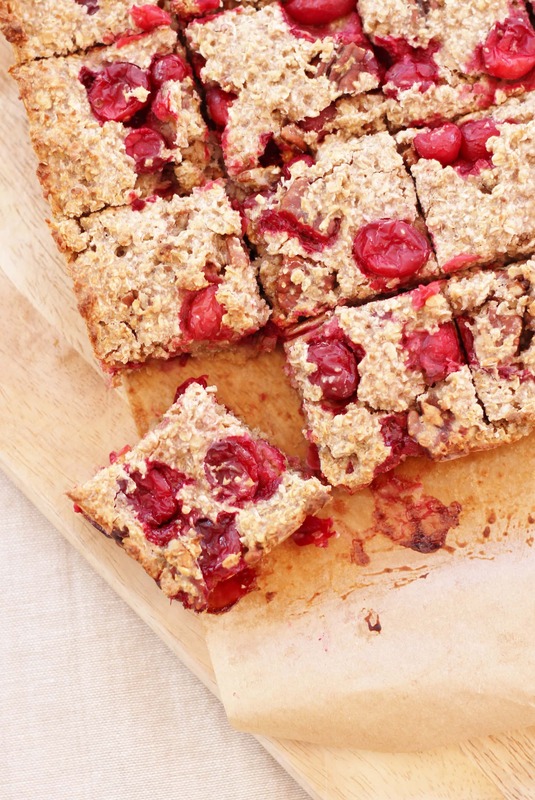 In fact it is to be encouraged as it makes these porridge squares even better!! Tip the mixture into the prepared tin and flatten. Bake for 20-25 minutes until golden on top and quite firm if you press the middle down. Allow it to cool for 5 minutes and then remove them from the tin (use the baking paper to help you) and place on a chopping board. Cut into 16 squares. 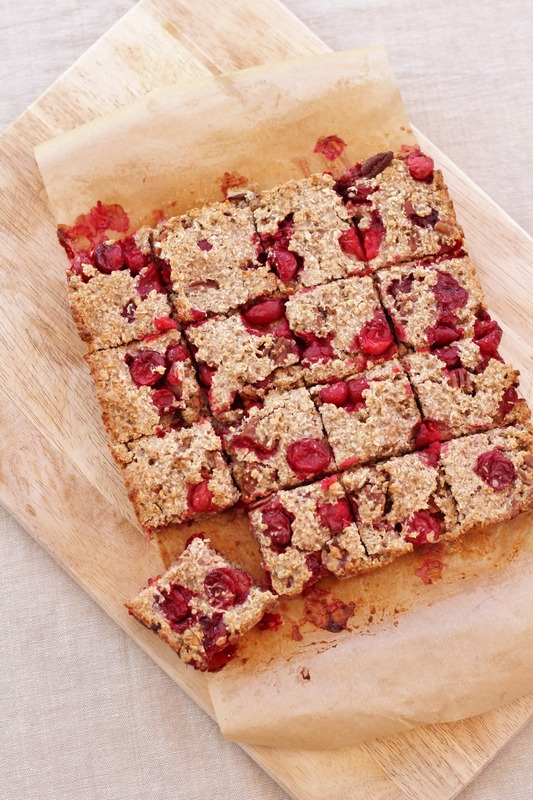 The cranberry porridge squares can be eaten warm or cold. Once cold, store in an airtight tin. They will keep well for a few days (well, in theory!). If you have frozen cranberries, they need to be defrosted first, but you can do this really quickly and easily by placing them in a bowl of warm water for 5-10 minutes and then you are good to go! Ooh these sound so good. I might even make them for Xmas breakfast if I can get organised! Yum. These sound GOOD! Love the brightness of the berries…. perfect for Christmas snacking the healthy way. O I love these! Cranberries are just so perfect and festive! Loving them so much this year! We love flapjacks in our house but try not to have them too often as they’re not the healthiest (at least not the way we make them). These sound like a great healthier alternative. Ooh my, these look soo good Eb, I love the fact that they are possitively bursting with cranberries rather than just a mere handful lurking ‘somewhere’ in the batch. I’ve been totally impressed by how much you’ve achieved these past few week, that’s not to mention the new bathroom you’ve had fitted….talk about challenging yourself! These look so yummy! I’ve never made anything with cranberries before so I might give this a try. I have the very same book. I like the raw banoffee pie slab recipe, have you tried it? I really like how you’ve added cranberries and cinnamon – very festive. Commenting as BritMums Baking Round-up Editor. Could I make these with Blueberries? I have so many in the freezer as our Blueberry bushes did very well this year.